The book articulate about the socio-cultural history of a community that dwells in District Pilibhit and Bareilly of western Uttar Pradesh, and District Udham Singh Nagar and District Nainital of Uttarakhand, India. During the eighteenth and nineteenth centuries, the area was widely popular as Rohilkhand after the name of “Rohila Afghans” once ruled the region in the eighteenth century. It’s a story of a diaspora formed in late eighteenth and early nineteenth century by few hundred Arain families immigrated from Punjab. The Arain is an agrarian tribe mainly settled in Punjab and parts of Sindh. The Terai plains of the Rohilkhand provided an opportunity to these thrifty, hardworking skilled agrarian immigrants to rose as a most disciplined zamindar of British governed districts of Pilibhit and Bareilly of United Province (British India). Interestingly, the members of the diasporic community were integrated with the social movement started as Anjuman-e- Arain, Hind in 1890 AD under the leadership of “Mian Family of Baghbanpura, Lahore” in Punjab. The social movement of the community gained the impetus when Sir Mian Mohammad Shafi accepted the leadership of his tribe as President of Anjuman-e-Arain, Hind in 1915 AD. An active member of Muslim League, All India Mohammedan Educational Conference, and President of All India Urdu association marked him as one of the most distinguished faces of Muslim Politics in Colonial India. In corridors of Colonial bureaucracy, he was elected as vice-president of Viceroy Executive Council in 1922 AD, a position attained by few Indian at that time. The leadership of Sir Mian Mohammad Shafi had a significant impact on the social structure of Arains even in Rohilkhand, the geographically far off place from Lahore. 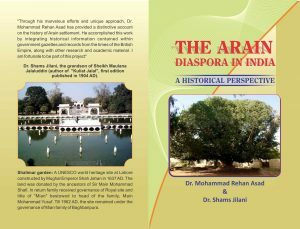 With changing backdrop of Indian politics, the small diaspora of Rohilkhand Arains also faced the brunt Indian partition and then abolishment of colonial zamindari system in 1952 AD. The confiscation of large zamindari estates compelled the young educated descendants to take a route to the newly created state of Pakistan. Around fifty percent of the youngster of the Arain population from District Pilibhit and Bareilly moved to Pakistan. The remaining half of the Indian side tried to integrate them with the fastest growing country delivering the growth rate of more than eight percent in last two decades. The tribe on the other side although prospered in the sixties and seventies but find themselves in a difficult situation in last two decades as a part of Urdu-speaking community in Sindh. The globalization provided an opportunity for educated families to relocate in western countries mainly Canada and United States. One can find Rohilkhand Arains both from Indian and Pakistan side in South Asian hubs of Mississauga and Houston carrying interesting folklores of their history and background. The nucleus of the community still dwells in the villages of District Pilibhit, Bareilly, and Nainital. Their language, cuisine, and customs reflected the unique blend created as a mix of Punjabi and local influences in last two centuries. The book will provide an evidence-based articulation to the history, culture and social background of the Arain community of Rohilkhand where youngsters are relying on multiple verbal narratives of history coming from previous generations. In Pakistan, the larger Arain tribe of Punjab will find a historical relationship with Rohilkhand Arains that are now labeled as Urdu-speaking Muhajirs from western Uttar Pradesh.